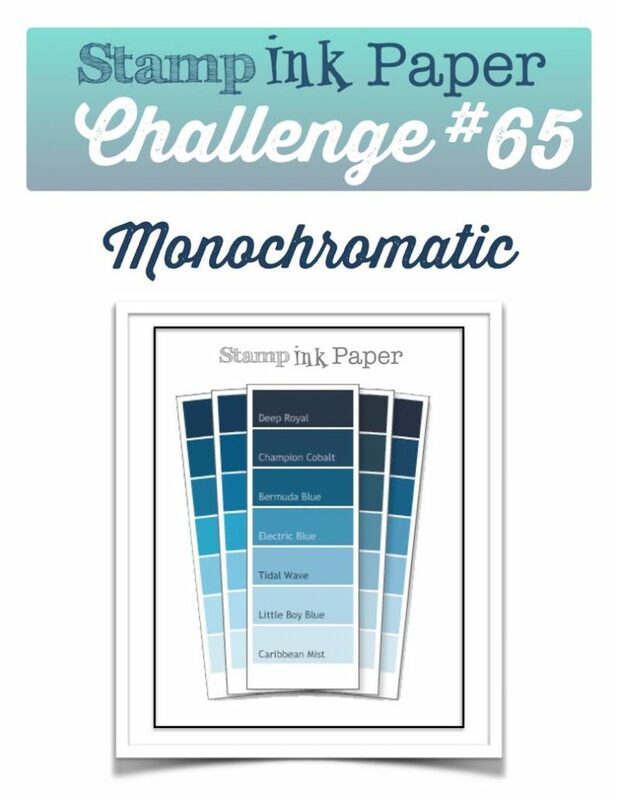 SIP Challenge 65 – Monochromatic! Home / Blog / SIP Challenge 65 – Monochromatic! To say that my day yesterday was rough is an understatement. It was a Monday to the 10th power. The reason for most of it… let’s just say that my Parent’s ran into more than a few issues once they arrived in Florida. I had to speak to the rental car company and then they got lost… for three hours! Sigh… it would have been so much easier if I had just gone with them! Everything is all fixed now, thank god! The day didn’t start off half bad. The ride to a from the airport was a little longer than I would have liked it to have been but I was mentally prepared for that. Renee got me a nice cake and gave me a really nice card, it was one of mine! LOL! My friend Patty brought me balloons! After work I came home and saw Taylor for a bit and then had peanut butter and jelly on waffles for dinner. Sue stopped by and dropped off a lovely shaker card and a Starbucks Gift Card, my favorite! I was so exhausted by the end of the day I didn’t have the energy to take pictures of some more of the lovely cards that I received so I will post those tomorrow. Thank you all for the Birthday wishes, they truly were the highlight of my day! 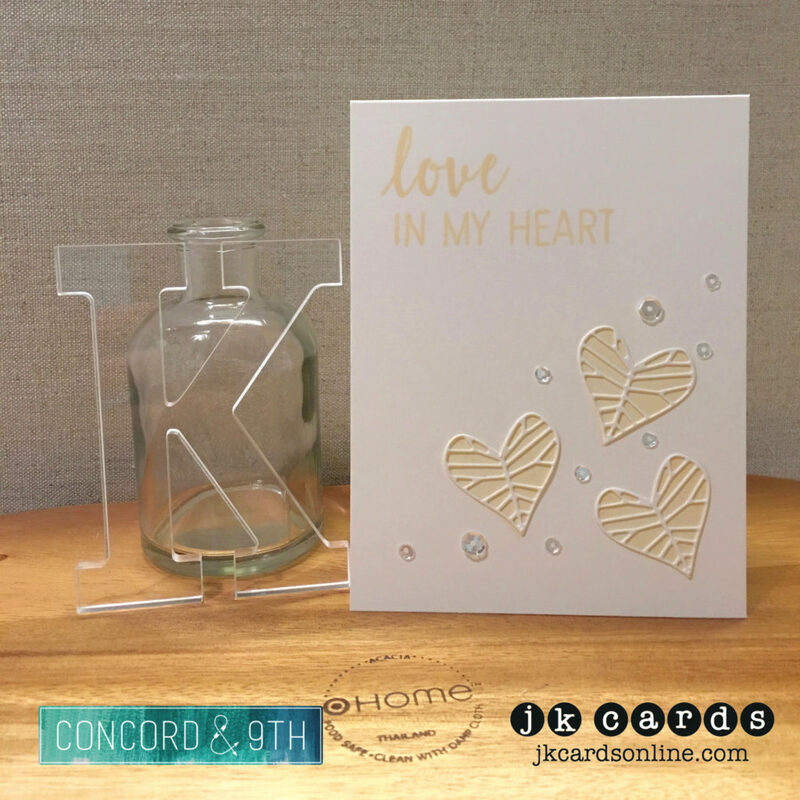 This entry was posted in Blog, Cards, Concord & 9th, Crafts, Embellishments, Hero Arts, Photopolymer, Pretty Pink Posh, Stamps and tagged Card Making, Concord & 9th, Crafts, Hero Arts, SIP Challenge. Bookmark the permalink. Raising parents can be such a challenge. Hope today is less stressful! Love today’s card! The textured hearts are stunning! Sorry you had such a rough birthday. Glad your parents arrived safely. Your card is a great take on the challenge. When I first saw your card, I wondered how you got the intense pale color. Using the Misti is very clever. I’ve been rebelling against taking the plunge to get one, but I’m seeing more and more ways I can use it. As others have posted, you are a terrific enabler. Not in a bad way! I love the diecut leaves as hearts! Genius! I hope your Tuesday is going better than your Monday. Sorry it wasn’t all you’d hoped for on your birthday. I know you’re happy to help your parents get everything settled and now they can enjoy their vacation. Take care. I have to agree with Linda E – at least that’s what my girls tell me. When they tell me how hard it is to raise me and their Dad I remind them that raising them wasn’t exactly a piece of cake either! LOL Lucky for me they turned out to be such wonderful, caring, generous and self reliant young ladies. I truly do love the softness of today’s card. The vanilla on the bright white card stock is very relaxing and comforting. That color combination would also be fabulous for someone going through a hard time. One can’t help but have a feeling of calmness when absorbing the calming colors together (or should I say lack of colors). Anyway, it is just gorgeous. Yes, unfortunately Linda is correct! I’m happy to help out my parent’s, even though I did want to scream a little, guess my parent’s did a good job with me just like you did with your girls! I love the light sentiment on the card too! I have never done that before but will definitely use it in the future! LOL, I’m sure your folks could share stories on the “Joy of raising You” .. It is hard when your family is in trouble and you are miles away. I’m glad they are afe and sound. Ha ha! Yes Linda, I’m sure that you are correct! I think that i was annoyed because I couldn’t help them as much as I wanted to! That was frustrating!